Proposed Installation Mock Up Image. In response to the #BlackLivesMatter movement, INJUSTICE ANYWHERE IS A THREAT TO JUSTICE EVERYWHERE addresses the systemic racism in the United States criminal justice system. Named after a quote by Dr. Martin Luther King, Jr., the project aims to criticize issues of racial profiling, police brutality, and racial inequality towards African-Americans in modern day America. INJUSTICE ANYWHERE IS A THREAT TO JUSTICE EVERYWHERE consists of a series of shooting targets made in the exact same measurements (23 in X 35 in) as the Peace Officer Standards and Training (POST) qualification shooting targets used by law enforcement departments across the country. Rather than the generic human body shape, the shooting targets have a “Hands Up, Don’t Shoot” silhouette, the hand gesture that became a rallying cry and protest symbol after the August 2014 shooting of Michael Brown. 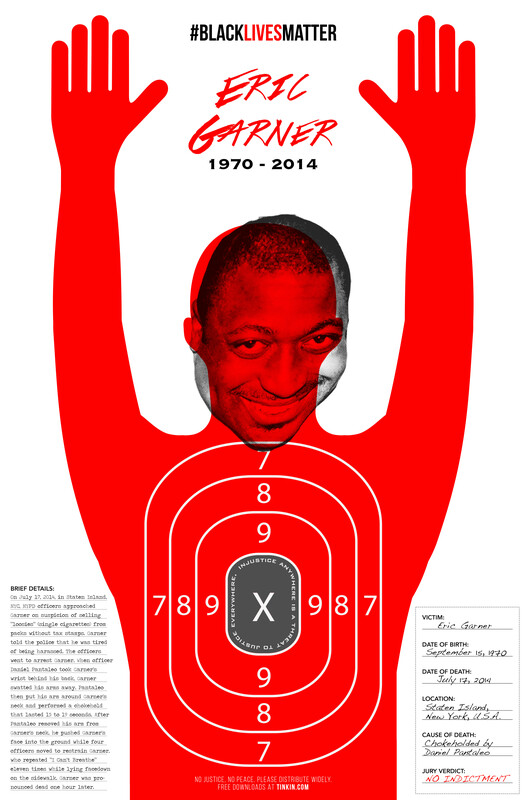 Each shooting target is superimposed with the face of a victim of police brutality, along with a brief details of what happened and the jury verdict. At the bullseye of each shooting target contains the quote “Injustice Anywhere is a Threat to Justice Everywhere.” by Dr. Martin Luther King, Jr. 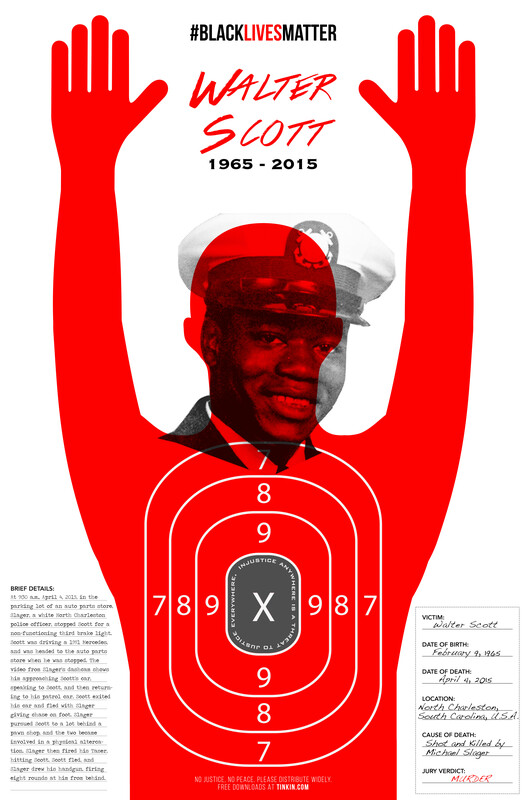 The choice of appropriating police shooting targets signifies the racial disparities in our criminal justice system. 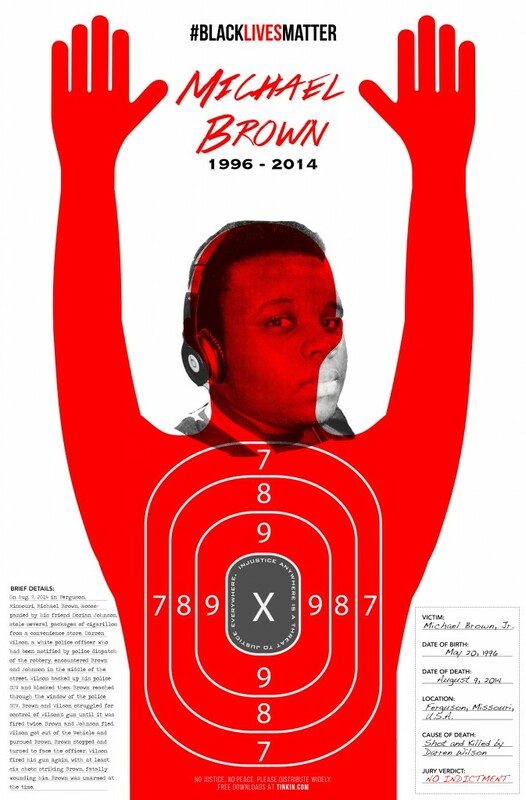 It also represents that African-Americans being the primary targets of racial profiling in our law enforcement system. 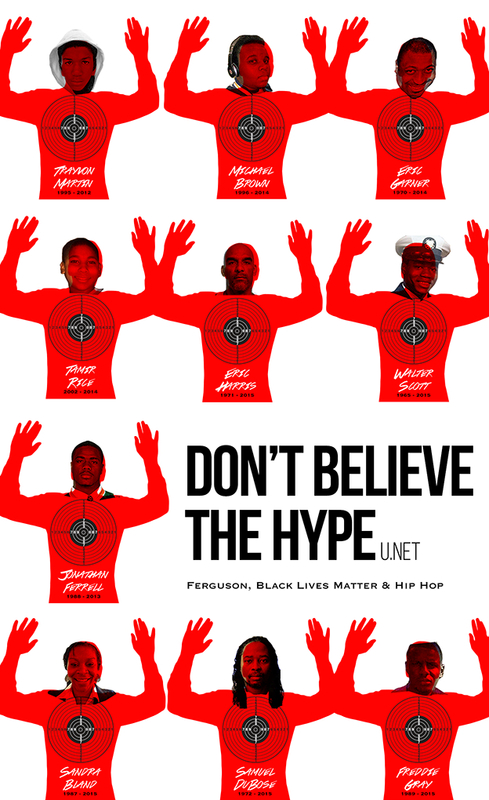 Don’t Believe the Hype is a snapshot on race and racism, repression and containment in today’s America. The book also highlights a new and growing racial-justice movement emerged to demand an end to state violence targeting black communities and social justice. 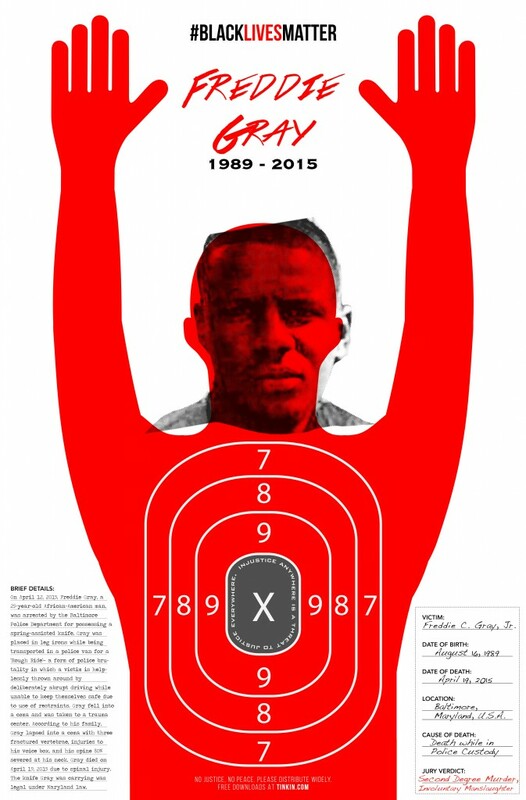 The use of red color represents the lives, struggles and bloodshed caused by the systemic and institutional racism. The gray color of the bullseye symbolizes the “Gray Areas” of law enforcement and criminal justice. 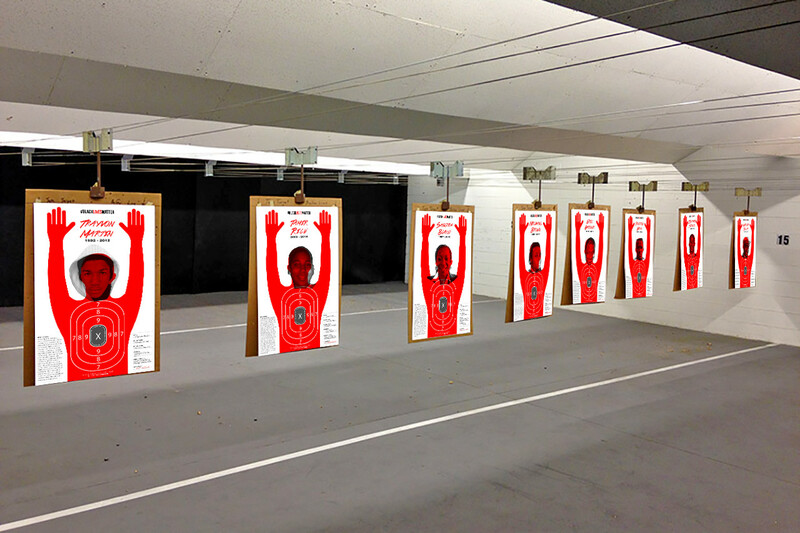 Each shooting target is made in the exact same measurements (23 in X 35 in) as the Peace Officer Standards and Training (POST) qualification shooting targets used by law enforcement departments across the country. BRIEF DETAILS: On the night of February 26, 2012, 17-year-old African American Trayvon Martin went to a convenience store and purchased candy and a canned drink. As Martin returned from the store, George Zimmerman, a member of the community watch, spotted him and called the Police to report him for suspicious behavior. Moments later, there was an altercation between the two individuals in which Martin was fatally shot in the chest. 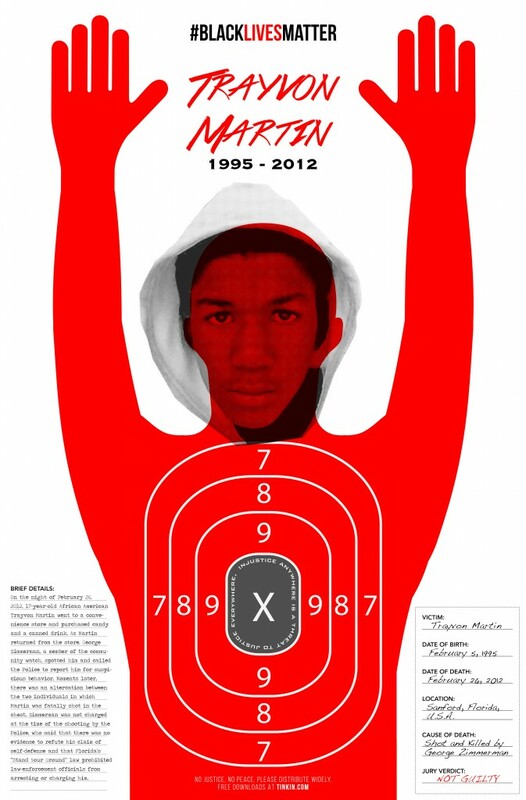 Zimmerman was not charged at the time of the shooting by the Police, who said that there was no evidence to refute his claim of self-defense and that Florida’s “Stand Your Ground” law prohibited law-enforcement officials from arresting or charging him. LOCATION: Charlotte, North Carolina, U.S.A.
BRIEF DETAILS: On September 14, 2013, Jonathan Ferrell, a former college football player for the Florida A&M University Rattlers, crashed his car in Charlotte, North Carolina. Ferrell went to a house and “banged on the door”, apparently looking for help. The resident called police, and three officers including Thornell Little and Randall Kerrick arrived. Little pointed his Taser’s red laser at Ferrell’s chest. Ferrell then ran towards them. One of the officers fired a taser at Ferrell and missed. Kerrick then opened fire on Ferrell, hitting him ten times and killing him. The officers handcuffed the mortally wounded Ferrell, who was lying face down in a ditch. 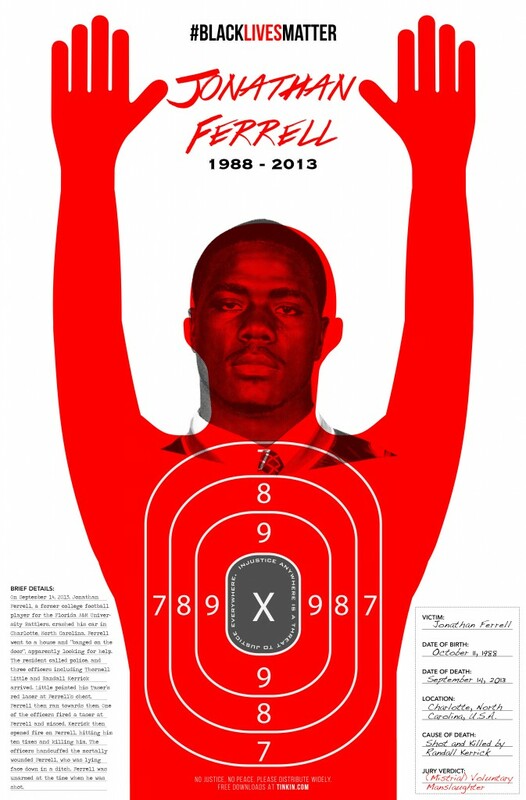 Ferrell was unarmed at the time when he was shot. LOCATION: Staten Island, New York, U.S.A.
BRIEF DETAILS: On July 17, 2014, in Staten Island, NYC, NYPD officers approached Garner on suspicion of selling “loosies” (single cigarettes) from packs without tax stamps. Garner told the police that he was tired of being harassed. The officers went to arrest Garner. When officer Daniel Pantaleo took Garner’s wrist behind his back, Garner swatted his arms away. Pantaleo then put his arm around Garner’s neck and performed a chokehold that lasted 15 to 19 seconds. After Pantaleo removed his arm from Garner’s neck, he pushed Garner’s face into the ground while four officers moved to restrain Garner, who repeated “I Can’t Breathe” eleven times while lying facedown on the sidewalk. Garner was pronounced dead one hour later. BRIEF DETAILS: On Aug. 9, 2014 in Ferguson, Missouri, Michael Brown, accompanied by his friend Dorian Johnson, stole several packages of cigarillos from a convenience store. Darren Wilson, a white police officer who had been notified by police dispatch of the robbery, encountered Brown and Johnson in the middle of the street. Wilson backed up his police SUV and blocked them. Brown reached through the window of the police SUV. Brown and Wilson struggled for control of Wilson’s gun until it was fired twice. Brown and Johnson fled. Wilson got out of the vehicle and pursued Brown. Brown stopped and turned to face the officer. Wilson fired his gun again, with at least six shots striking Brown, fatally wounding him. Brown was unarmed at the time. ‘Michael Brown’ Store Robbery! RAW Video Footage! BRIEF DETAILS: At 10:00 p.m. Oct 20, 2014, police were called to investigate Laquan McDonald responding to reports that he was breaking into vehicles in a trucking yard. When officers confronted McDonald, he used a knife with a 3-inch blade to slice the tire on a patrol vehicle and damage its windshield. The officers requested Taser backup. 10 minutes later officer Van Dyke and his partner arrived. Within six seconds of exiting the police car, Van Dyke opened fire while McDonald was facing away from the officers. McDonald fell to the ground after the first shot. Van Dyke paused for a moment, then emptied his 16-round handgun when McDonald moved, knife still in hand. 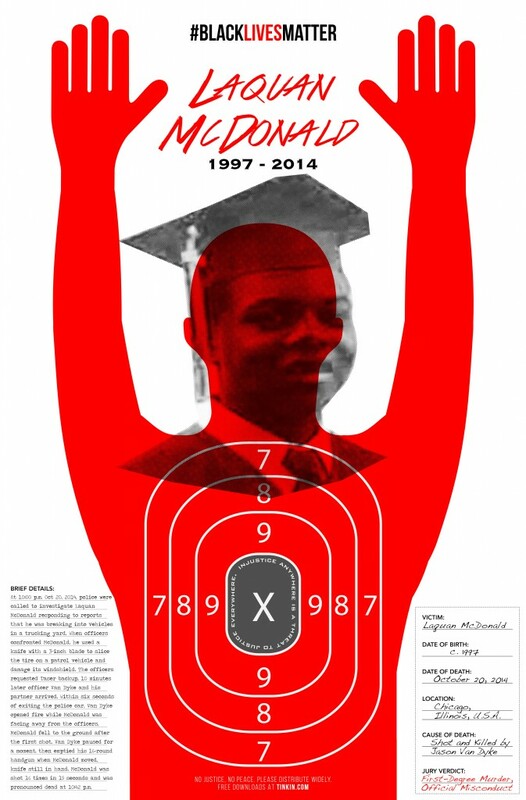 McDonald was shot 16 times in 15 seconds and was pronounced dead at 10:42 p.m.
BRIEF DETAILS: Two police officers, 26-year-old Timothy Loehmann and 46-year-old Frank Garmback, responded after receiving a police dispatch call “of a male black sitting on a swing and pointing a gun at people” in a city park. The caller repeatedly said of the pistol “it’s probably fake.” Within two seconds of arriving on the scene, Loehmann fired two shots before the zone car had come to a halt, hitting the 12-year-old boy Tamir Rice once in the torso. Neither officer administered any first aid to Rice after the shooting. Rice died on the following day. The officers reported that upon their arrival, Rice reached towards a gun in his waistband. Rice was carrying a toy airsoft gun at the time. BRIEF DETAILS: The shooting of Eric Courtney Harris occurred on April 2, 2015, where 44-year-old Eric Courtney Harris was fatally shot during an undercover sting in Tulsa, Oklahoma as Harris ran from authorities unarmed. While Harris was being subdued, Tulsa County Reserve Deputy Robert Charles “Bob” Bates, 73, confused his personal weapon, a Smith & Wesson .357 revolver, for a Model X26 Taser. 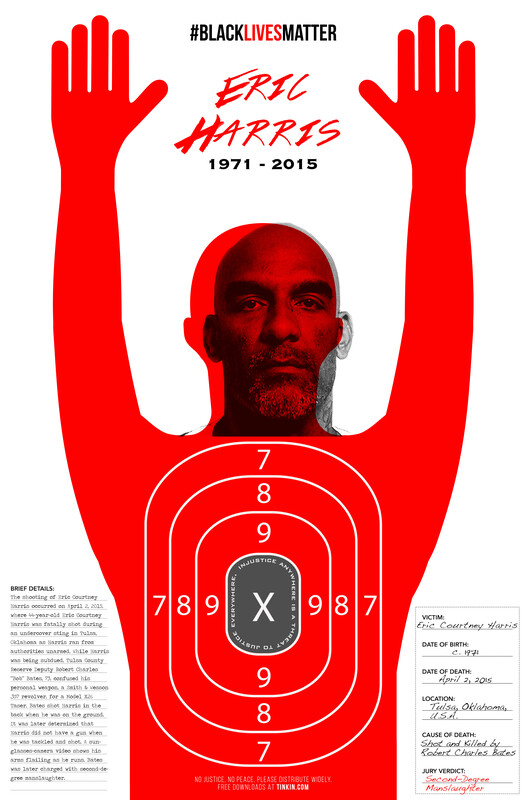 Bates shot Harris in the back when he was on the ground. It was later determined that Harris did not have a gun when he was tackled and shot. A sunglasses-camera video shows his arms flailing as he runs. Bates was later charged with second-degree manslaughter. LOCATION: North Charleston, South Carolina, U.S.A.
BRIEF DETAILS: At 9:30 a.m., April 4, 2015, in the parking lot of an auto parts store, Slager, a white North Charleston police officer, stopped Scott for a non-functioning third brake light. Scott was driving a 1991 Mercedes, and was headed to the auto parts store when he was stopped. The video from Slager’s dashcam shows him approaching Scott’s car, speaking to Scott, and then returning to his patrol car. Scott exited his car and fled with Slager giving chase on foot. Slager pursued Scott to a lot behind a pawn shop, and the two became involved in a physical altercation. Slager then fired his Taser, hitting Scott. Scott fled, and Slager drew his handgun, firing eight rounds at him from behind. BRIEF DETAILS: On April 12, 2015, Freddie Gray, a 25-year-old African-American man, was arrested by the Baltimore Police Department for possessing a spring-assisted knife. Gray was placed in leg irons while being transported in a police van for a ‘Rough Ride’—a form of police brutality in which a victim is helplessly thrown around by deliberately abrupt driving while unable to keep themselves safe due to use of restraints. Gray fell into a coma and was taken to a trauma center. According to his family, Gray lapsed into a coma with three fractured vertebrae, injuries to his voice box, and his spine 80% severed at his neck. Gray died on April 19, 2015 due to spinal injury. The knife Gray was carrying was legal under Maryland law. Raw Video: Freddie Gray Arrested By Baltimore Police! 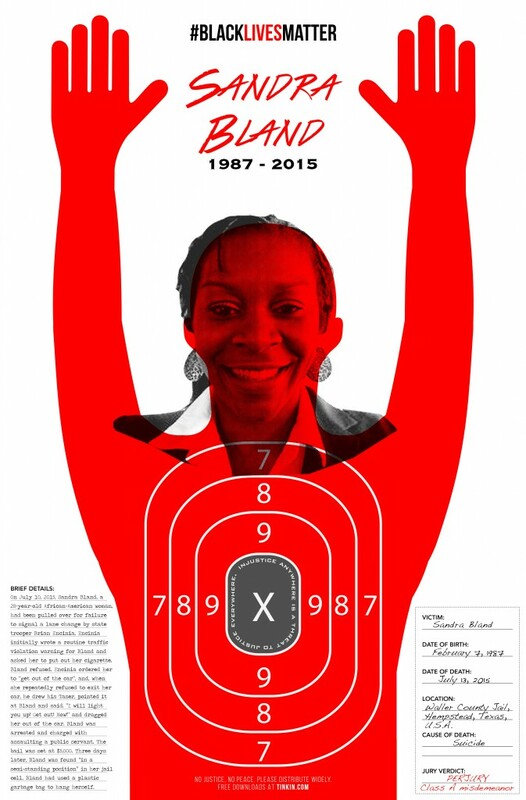 LOCATION: Waller County Jail, Hempstead, Texas, U.S.A.
BRIEF DETAILS: On July 10, 2015, Sandra Bland, a 28-year-old African-American woman, had been pulled over for failure to signal a lane change by state trooper Brian Encinia. Encinia initially wrote a routine traffic violation warning for Bland and asked her to put out her cigarette. Bland refused. Encinia ordered her to “get out of the car”, and, when she repeatedly refused to exit her car, he drew his Taser, pointed it at Bland and said, “I will light you up! Get out! Now!” and dragged her out of the car. Bland was arrested and charged with assaulting a public servant. The bail was set at $5,000. Three days later, Bland was found “in a semi-standing position” in her jail cell. Bland had used a plastic garbage bag to hang herself. BRIEF DETAILS: At 6:30 p.m. July 19, 2015, Ray Tensing, a white University of Cincinnati police officer was patrolling off-campus when he stopped Samuel DuBose for failure to display a front license plate. Tensing repeatedly requested DuBose’s driver’s license. DuBose stated that he did not have it with him. Tensing asked “Are you suspended?” Tensing started to open the driver’s door and ordered DuBose to remove his seat belt. DuBose pulled the door closed, started the engine, and put the car in drive. Within the next few seconds, Tensing reached into the car with his left hand, yelled “Stop! 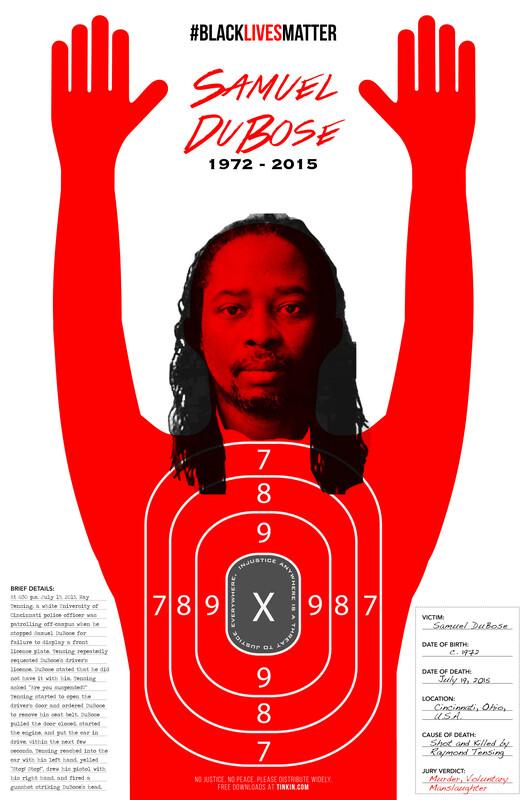 Stop!”, drew his pistol with his right hand, and fired a gunshot striking DuBose’s head. The installation is set up like an realistic shooting range with all different shooting targets hung on the rail slide. On the wall is a projection of available police dashcam videos from each shooting incident. This work is licensed under a Creative Commons Attribution-NonCommercial 4.0 International License. All the shooting targets are free for download and copyright free for distribution under the Creative Commons license. Publics are encouraged to print and share and use them for any purposes. The list of victims is organized in chronological order.